Bronchial Artery Embolization in Massive Haemoptysis: Standard treatment guidelines. Massive hemoptysis constitutes a significant and often life-threatening respiratory emergency and carries a poor prognosis when treated conservatively, with mortality rates ranging from 50% to 80%. The cause of death is usually asphyxiation, not exsanguination . Bronchial artery embolisation (BAE) as well as embolisation of a few relevant systemic arteries have become the established procedure in the management of massive and recurrent haemoptysis since 1973. The efficacy, safety, and utility of BAE in controlling massive hemoptysis have been well documented in many subsequent reports. Moreover, because of poor pulmonary reserve and other medical co-morbid conditions, most patients with massive hemoptysis are not surgical candidates. The reported mortality rates for surgery performed for massive hemoptysis range from 7.1% to 18.2% . However, the mortality rate increases significantly, up to about 40%, when the surgery is undertaken as an emergency procedure.BAE is effective in an elective surgery. However, surgery is indicated in massive haemoptysis due to hydatid cyst, thoracic vascular injury, bronchial adenoma, and aspergilloma which are resistant to other therapies. Ministry of Health and Family Welfare has come out with the Standard Treatment Guidelines for Bronchial Artery Embolization. Following are its major recommendations for Interventional Radiology. Massive haemoptysis has been described as the expectoration of an amount of blood ranging from 100 ml to more than 1,000 ml over a period of 24 hours, and the most widely used criterion is the production of 300–600 ml per day. A life-threatening condition may be caused by even a rather small amount of hemorrhage depending on the ability of the patient to maintain a patent airway. Thus, interventional management should be undertaken whenever the amount of hemorrhage has the potential to cause a life threatening condition. Pulmonary tuberculosis has been the commonest cause of haemoptysis in India for more than four decades. It had been shown to be present in 79.2% of haemoptysis cases in the year 2009. After confirming the presence of blood, an initial task is to differentiate between haemoptysis, pseudo haemoptysis (i.e., the spitting of blood that does not come from the lungs or bronchial tubes), and haematemesis (i.e., the vomiting of blood). In the non-Western world, pulmonary tuberculosis and tubercular bronchiectasis, are the most common underlying causes of massive haemoptysis whereas bronchogenic carcinoma and chronic inflammatory lung diseases due to bronchiectasis, cystic fibrosis, or aspergillosis are the more prevalent causes of haemoptysis in Western countries.Other relatively common causes include lung abscess, pneumonia, chronic bronchitis, pulmonary interstitial fibrosis, pneumoconiosis, congenital cardiac or pulmonary vascular anomalies such as arterio-venous malformation, pulmonary embolism, elevated pulmonary venous pressure (mitral stenosis), systemic coagulopathy, use of anticoagulants or thrombolytic agents. Since pulmonary tuberculosis, bronchiectasis and malignancy are common etiologic causes in our country, creating awareness about importance of their early detection and seeking early medical attention( for cough more than 3 weeks, unexplained fever, weight loss, chronic purulent sputum, haemotysis) at appropriate medical facility is an effective preventive strategy. Proper counseling of the patient should be done by explaining various treatment options including non-surgical treatments such as bronchoscopy guided interventions and bronchial artery embolization and their outcome. The importance of cessation of smoking to reduce risk of haemoptysis due to chronic bronchitis should also be duly emphasized. Clinical Diagnosis: After establishing true haemoptysis, the rate and volume of blood loss should be assessed. Historical evaluation must include important risk factors such as history of fever, weight loss, smoking, chronic obstructive pulmonary disease, exposure to asbestos, arsenic, chromium, nickel and certain ethers, anticoagulant use, heart disease, known malignancy elsewhere in the body, nausea, vomiting, malena, alcoholism, chronic use of non steroidal anti-inflammatory drugs, history of chronic purulent sputum production and frequent pneumonias including past history of pulmonary tuberculosis. Physical Examination: General Physical examination: Recording of vital signs, pulse oximetry levels, fever, tachycardia, tachypnea, weight changes and hypoxia. Constitutional signs such as cachexia and level of patient distress, cyanosis, pallor, clubbing, ecchymoses, telangiectasia, gingivitis, evidence of bleeding from the oral or nasal mucosa, lymph node enlargement in neck, supraclavicular region, and axillae. Examination of chest and lungs for signs of consolidation, wheezing, rales and trauma. Cardiovascular examination includes evaluation for jugular venous distention, abnormal heart sounds and edema. Chest radiography may provide the diagnosis in only 50% of cases and could demonstrate lesions which suggest either a localized pneumonia, acute or chronic pulmonary tuberculosis, healed tuberculosis, bronchogenic cancer or lung abscess. The role of CT in the evaluation of patients with hemoptysis has been validated. CT has proved to be of considerable value in diagnosing bronchiectasis, bronchogenic carcinoma, and aspergilloma in patients with massive hemoptysis. CT may demonstrate lesions that may not be visible on conventional radiographs, and contrast material–enhanced CT may help detect vascular lesions that cause massive hemoptysis. CT findings can suggest a specific diagnosis in 50% of patients in whom CT can also help localize the site of bleeding in 63%–100% of patients with haemoptysis . The management of a patient with haemoptysis has three objectives – cessation of bleeding, prevention of aspiration and treatment of the underlying cause. As with any potentially serious condition, the initial approach would involve evaluation of the airway, breathing, and circulation (ABC). Massive haemoptysis warrants a more aggressive approach, sometimes requiring intensive care and early consultation with a pulmonologist. Reassurance and reduction of anxiety are beneficial. In cases of massive or life threatening haemoptysis, diagnosis and therapy must occur simultaneously. Maintenance of the airway is vital because the primary mechanism of death is asphyxiation, not exsanguination. Other measures include -supplemental oxygen, fluid resuscitation, hypotensive agents in adults if significantly hypertensive, blood transfusion, correction of coagulopathy, if necessary and intravenous antibiotics. 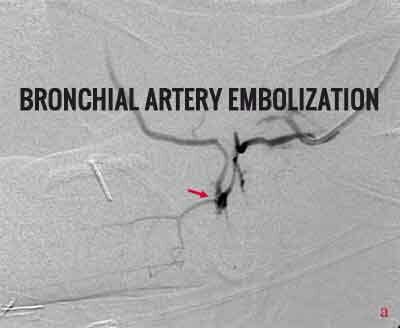 If facilities for bronchial artery embolization or bronchoscopic intervention are not available, patient must referred to a hospital where these facilities are available. After establishing true haemoptysis, the rate and volume of blood loss should be assessed. Historical evaluation must include important risk factors such as history of fever, weight loss, smoking, chronic obstructive pulmonary disease, exposure to asbestos, arsenic, chromium, nickel and certain ethers, anticoagulant use, heart disease, known malignancy elsewhere in the body, nausea, vomiting, malena, alcoholism, chronic use of non steroidal anti-inflammatory drugs, history of chronic purulent sputum production and frequent pneumonias including past history of pulmonary tuberculosis. Multidetector CT is the investigation of choice for stable patients to show whether there are any hypertrophied bronchial arteries suitable for embolization and should be arranged as soon as possible after admission in a patient with massive haemoptysis. If hypertrophied bronchial arteries are (> 2mm in adults, significant chances are that these are responsible for haemoptysis. Multidetector CT allows rapid scanning, making timely examination feasible in critically ill patients. In addition, hypertrophied non bronchial systemic feeder vessels can be detected which contribute to the recurrence of haemoptysis after successful embolization of bronchial arteries. CT versus Bronchoscopy The overall diagnostic accuracy of fiberoptic bronchoscopy (FOB) in evaluating patients with haemoptysis is reported to be 10%–43% .Bronchoscopy is unnecessary in patients with hemoptysis of known cause if the site of bleeding can be determined on conventional radiographs. Bronchoscopy may have disadvantage in massive, active haemoptysis as it is difficult to localize the bleeding site if there is excessive blood in the bronchi. ronchial therapies are not effective in most cases of massive haemoptysis. Bronchoscopy guided interventions are not effective in most cases of massive haemoptysis.Other disadvantages of bronchoscopy include possible airway compromise due to sedation, delay in treatment, hypoxemia and extra cost. CT should be performed prior to bronchoscopy in all patients with haemoptysis . A review of the patient’s previous medical records and value of the forced expiratory volume (FEV1) may help in determining the feasibility of surgery. The interventional radiologist and the thoracic surgeon should be informed about admission of patient with severe haemoptysis. IV Tranexamic Acid – 10mg/kg/td. Daily for 7 days if repeated bleeding occurs over a short period. If more than 100ml haemoptysis occurs on the third day, addition of intravenous Terlipressin (2mg bolus, followed by 1mg to 2mg every 4-6 hours (for a maximum duration of 72 hours) to control bleeding may be considered. However, this should not to be used in pregnancy. Bronchoscopic interventions are rarely useful in the acutely bleeding patient. In massive haemoptysis, rigid bronchoscopy, though technically difficult, may sometimes allow clot removal (with the additional risk of precipitating further bleeding), temponade of bleeding site using a Fogarty catheter or achieving haemostasis with thrombin glue or cold saline/ vasoconstrictor lavage. In unstable patients, bronchial artery and embolization may be performed following chest radiograph, haematological & coagulation profile and renal function tests. The source of massive haemoptysis is usually the bronchial circulation (90% of cases) rather than the pulmonary circulation (5%). In a minority of cases (5%), massive haemoptysis may originate from non bronchial systemic arterial supply to the lungs. In many acute and chronic lung diseases, the pulmonary circulation is reduced or occluded at the level of the pulmonary arterioles because of hypoxic vasoconstriction, intravascular thrombosis, and vasculitis. As a result, bronchial arteries proliferate and enlarge to replace the pulmonary circulation. The enlarged bronchial vessels, which exist in an area of active or chronic inflammation, may be ruptured due to erosion by a bacterial agent or due to elevated regional blood pressure. The arterial blood under systemic arterial pressure subsequently extravasates into the respiratory tree, resulting in massive haemoptysis. Previous studies have shown that BAE is very effective in controlling acute massive haemoptysis with initial non-recurrence rates reported to be 73%–98%.Recurrence of bleeding may be caused by recanalization of embolized vessels, incomplete embolization, revascularization by the collateral circulation, inadequate treatment of the underlying disease, progression of basic lung disease, or non bronchial systemic arterial supply.Recurrent bleeding is more common in patients with chronic tuberculosis, aspergilloma, or neoplasm. Long-term recurrence rates have been reported to be 10%–52%. However, the longterm success rate can be improved with repeat BAE. Haemoptysis may recur after successful BAE if the disease process is not controlled with drug therapy or surgery because embolization treats the symptom but not the underlying disease. Chest pain is the most common complication, with a reported prevalence of 24%–91%. Chest pain is likely related to an ischemic phenomenon caused by embolization and is usually transient. Transient dysphagia due to embolization of esophageal branches may be seen sometimes with a prevalence of 0.7%–18.2%. The most serious complication of BAE is spinal cord ischemia due to the inadvertent occlusion of spinal arteries. The prevalence of spinal cord ischemia after BAE is reported to be 1.4%–6.5%. The visualization of radicular branches on bronchial or intercostal angiograms is not an absolute contraindication for BAE. However, when the anterior medullary artery (artery of Adamkiewicz) is visualized at angiography, embolization should not be performed. Other rare complications include aortic and bronchial necrosis, bronchoesophageal fistula, non–target organ embolization (eg, ischemic colitis), pulmonary infarction, referred pain to the ipsilateral forehead or orbit, and transient cortical blindness. Non bronchial systemic arteries can be a significant source of massive haemoptysis especially in patients with pleural involvement caused by an underlying disease. In the presence of pleural thickening, non bronchial systemic feeder vessels that originate from various arteries, for example, intercostal artery, branches of the subclavian and axillary arteries , internal mammary artery, inferior phrenic artery may develop along the pleural surface and become enlarged as a result of the inflammatory process. Use of CT to predict the presence of non bronchial systemic vessels that supply a parenchymal lesion is important prior to BAE because it helps in localizing the site of bleeding and in selecting systemic vessels for the interventional approach. Out Patient- This is not applicable as all patients with massive haemoptysis should be admitted for management. Day Care – This is not applicable as all patients with massive haemoptysis should be admitted for management. Referral criteria: In case, haemoptysis is not controlled, repeat embolization may be performed. However, in case of no significant clinical improvement, option of Surgery in the form of resection of diseased part of the lobe or lung may be considered by thoracic surgeon. Nurse – Assisting during the procedure as well as before and after interventional treatment. Technician- Performing the CT scan and assisting in the BAE procedure.